Garred, M. 2019. Identity Markers and Human Creativity. à propos magazine, 159, on Religion, Conflict and Peacebuilding. Garred, M. 2018. Weaving Peace in Mindanao: Strong Advocacy through Collective Action. Cambridge, MA: CDA Collaborative Learning Projects. Garred, M., Booth, C., Barnard-Webster, K., and Saleh, O. 2018. Do No Harm and Gender: A Guidance Note. Cambridge, MA: CDA Collaborative Learning Projects. Garred, M. and Abu-Nimer, M., eds. 2018. Making Peace with Faith: The Challenges of Religion and Peacebuilding. Lanham, MD: Rowman & Littlefield. Woodrow, P., Oatley, N. and Garred, M. 2017. Faith Matters: A Guide for the Design, Monitoring & Evaluation of Inter-Religious Action for Peacebuilding. CDA Collaborative Learning Projects and Alliance for Peacebuilding. Garred, M. with O’Reilly-Calthrop, S., Midgley, T. and Scott, M. 2015. Making Sense of Turbulent Contexts: Local Perspectives on Large-Scale Conflict. World Vision International. Midgley, T. and Garred, M. 2013. Bridging the Participation Gap: Developing Macro-Level Conflict Analysis through Local Perspectives. London: World Vision UK. Garred, M. 2013. The Power of Mindsets: Bridging, Bonding and Associational Change in Deeply Divided Mindanao. Journal of Civil Society, 9:1. Garred, M. with Castro, J. 2011. Conflict-Sensitive Expressions of Faith in Mindanao: A Case Study. Journal of Religion, Conflict and Peace, 4:2. Garred, M. 2011. Conflict Sensitivity and Religious Associations: An Action Research Journey in Southeast Asia. Ph.D. thesis, Lancaster University. Garred, M. and Goddard, N. 2010. Do No Harm in Mindanao: Ingenuity in Action. ‘Do No Harm’ Reflective Case Studies. Cambridge, MA: CDA Collaborative Learning Projects. Davao Ministerial Interfaith. 2010. Transformed Together: A Journey with Local Capacities for Peace. Davao City, Philippines. Garred, M. et al. 2007. 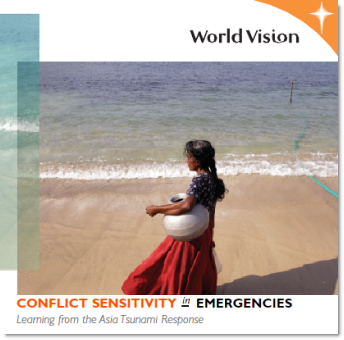 Conflict Sensitivity in Emergencies: Learning from the Asia Tsunami Response. Singapore: World VisionAsia-Pacific Region. Garred, M., ed., with Abu-Nimer, M. 2006. A Shared Future: Local Capacities for Peace in Community Development. Monrovia, CA: World Vision International.